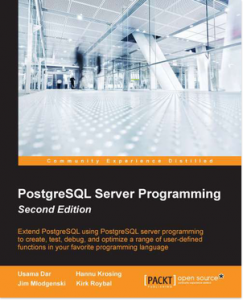 This practical guide leads you through numerous aspects of working with PostgreSQL. Step by step examples allow you to easily set up and extend PostgreSQL. Fully integrate the database layer into your development. You will get to grips with creating libraries of useful code, grouping them into even more useful components, and distributing them to the community. Then, you will take a look at user-defined functions, and how to define and utilize them efficiently. You will also learn how to extract data from a multitude of foreign data sources and extend PostgreSQL to do it natively. What’s more, you can do all of this in a nifty debugging interface that will allow you to do it efficiently and reliably. This book explores all possible ways to extend PostgreSQL and write server-side code using various programming languages with concrete and easy-to-understand examples.